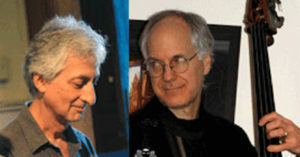 The Tuesday Club of Stockbridge presents an intimate and brilliant concert at the historic First Congregational Church in Stockbridge, MA featuring a varied program of Jazz, American Song Book Standards, Armenian songs and original compositions by pianist ARMEN DONELIAN and bassist DAVID CLARK. Armen & David have performed and taught workshops together for over 25 years and during this period in Donelian’s trio with drummer George Schuller since 2005. Their telepathic chemistry transforms even the simplest of tunes into extended works of great creative artistry. Admission $20. Checks payable to The Tuesday Club c/o Sharon Hughes, 75 Pine Knoll Road, Lenox, MA 01240 for ticket pick up at Will Call, or cash at the door. Doors open 3:30pm. Refreshments & CD sales to follow.